Just like something out of the great Saturday Night Live "Taco Town" sketch, Taco Bell has brought back the Cheesy Gordita Crunch. The "Cheesy G" is "layered with chewy Gordita flatbread, a Beef Crunchy Taco and a blend of three melted cheeses in between." It will return October 16 through November 19 and will cost $1.49. 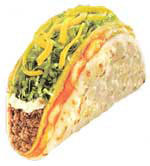 To celebrate the grodita's return, Taco Bell today announced a nationwide online search for the cheesiest pick up lines. Beginning today, fans can go to www.tacobell.com to submit their cheesiest pick-up lines for a chance to win a month’s supply of Cheesy Gordita Crunches ($50 in Taco Bell Bucks). Taco Bell will announce a winner a week for four weeks, with one grand prize winner earning the chance to win a year’s supply of Taco Bell ($350 in Taco Bell Bucks). Although it hasn't been promoted or listed on the menu, the cheesy gordita crunch has been available for the last few years. Unlike the delicious chili cheese burritio, you can still order the cheesy gordita crunch at any time...I have never once been turned down when requesting one.